Bloom this next season, and incorporate all your corresponding closet pieces too. 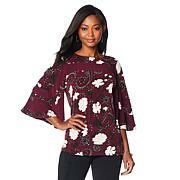 This top gives you full range of flirty style, all in a comfortable and flattering top. This top is beautiful! I ordered it in purple and will be ordering the other two colors as well! The elastic top is very loose; no way to wear it without a strapless bra (and I'm close to 80yrs old). The construction appears cheap. There are side seams and those black stripes are nowhere near to matching up. Sadly, I returned this; it looked so pretty on TV. We love all floral prints, but some just take our breath away. This artistic rose print infuses lightweight crepe with vivid lines and colors. 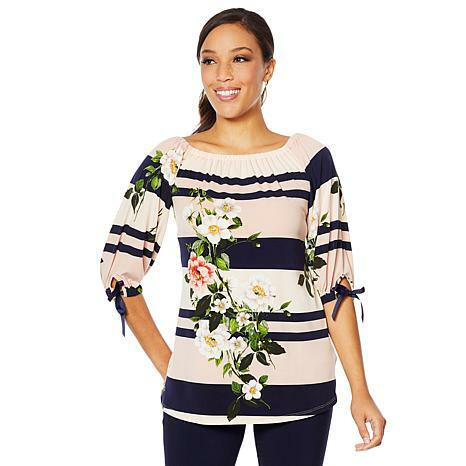 And then there are the sleeves — long and ruffled for a fun, flirty statement. A slight hi-low hem and v-neckline round out the stylish silhouette.